Embedded Linux is a fast growing operating system which has the edge over other operating systems in reliability, scalability, modularization and robustness. With its open source model Linux has given developer independence and thereby the possibilities of increased innovation with limited effort. The scalability of Linux has enabled this operating system to fit into virtually anything. And that has made Linux a sure winner in the field of embedded system development. Engineers at e-con Systems believe at contributing back to the Linux community and are active members in many of the popular mailing lists. e-con Systems has done Linux porting on to new ARM cores as well as on processors that didn't have any native core. This means writing a new entry.S file to make sure the port is done to the new architecture. Porting of Linux to a new ARM based silicon with no prior Linux port before. Porting of Linux on a completely new core, where a previous port was not available. Development of Linux BSP for platforms that are customized out of a reference design. These include platforms designed from processors like OMAP3530, DM3730, DM355, DM365, PXA320, i.MX31 and i.MX27. The amount of study that has gone into the Linux kernel has given engineers at e-con complete understanding of the Linux architecture and source code. R&D efforts in the Linux kernel are a regular in the e-con activity list. With this level of expertise, e-con Systems can definitely speed up the development time and thereby secures a special place in the embedded arena where "time to market" is the key difference between success and failure. e-con Systems Embedded Linux team has experience in writing drivers for custom devices. e-con Systems in the past has worked on the device driver development in the following areas. Framebuffer Driver for Video Graphics Controllers. Camera drivers - e-con has a dedicated team of Engineers working on the Linux camera driver development and supporting Video for Linux. e-con Systems has support for 1.3M pixel, 2M pixel and 3.2M pixel camera modules with drivers for Linux and support for Video for Linux too. Please refer e-con's Camera Board / Camera Module page for more information. 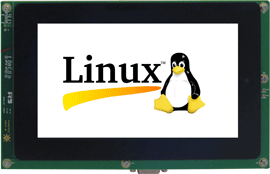 Touch screen – e-con has optimized Linux touch screen drivers on top of touch screen controllers like TSC2301, UCB1400 for platforms running embedded Linux. e-con has developed touch screen optimization modules on top of GUI like Qtopia 2.2.0 for various touch screen controllers. 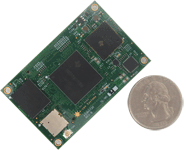 Nand flash – e-con Systems has developed Linux NAND flash drivers and is currently developing open NAND Flash interface (ONFI) support in Linux. e-con supports OS boot from NAND flash too and hence support u-boot level bad block management too. GPRS – e-con has developed support for GPRS in Linux. e-con Systems has developed a daughter card with SIM508 GPRS modem. Such daughter cards can be directly interfaced with any single board computer having RS232 interface. Dialer application such as wvdial is available on top of these GPRS modems. Please refer GPRS/GPS page for more information. e-con Systems has developed reference designs which run the latest Linux kernels. The Almach - eSOM3730 reference design running Linux. e-con Systems is committed towards open embedded and has its reference designs running Angstrom distribution. For more details and other features visit Almach Platform page, For Documentation visit Almach Developer resources. e-con Systems has developed eSOM3730 Computer on module that run Linux. eSOM3730 computer on module is based on AM3703 / DM3730 processor- an ultra low power microprocessor running up to 1GHz, mobile LPDDR SDRAM configurable from 128MB to 512MB and NAND flash configurable from 256MB to 512MB. Please refer eSOM3730 Page for more information. For more details of the Kernel, Filesystem and Application Features on this System on module, please refer Linux BSP page. During component selection – Processor should be able to run at 1V and also all the peripherals like SDRAM should be low powered one meaning should be operational at 1.8V. e-con has got very good experience in choosing the components and has successfully designed products on the same. Device driver development - In Linux, if the power management APIs for each device is handled in the device driver. To drive the device to sleep mode the device drivers are notified by the power management portion of the BSP. Power management policy – This is quite dynamic. The policy is more dependent on the application of the device. For example, if a user is watching Video and not touching the mobile device for 15 minutes then the device should not go to standby mode. To solve this problem, e-con proposes a policy where there will be different power management profiles based on what type of customer would use the product. Embedded systems are becoming more and more sophisticated these days. Embedded systems are becoming replacements for PCs in entertainment and Personal assistance (e.g. set top boxes and PDA/Tablets). These necessities call for good GUI, word processing, etc. with more hardware constraints. e-con has responded to this call with the state-of-art application development. e-con has skilled programmers in Qt and Qtopia who have developed a complete desktop environment for the set top box. The current open source Android releases are targeted towards smart phones and tablets (from Android 3.0). The Android framework provides the scope to customize it for any product/platform.